You’ve probably heard people say they enjoy running because it lets them switch off. Perhaps you feel that way yourself. Well recent research in mice suggests there may actually be a scientific basis for this, because brain activity really does decrease when you’re performing a simple, repetitive action. What’s more, while running may tire your body out, such exercise might actually reduce your brain’s need for sleep. Being awake and being asleep aren’t two mutually exclusive, uniform states. At times you can be more deeply asleep or more wide awake than others, and the boundary between the two can be blurred. Your normal behaviour, such as the ability to react quickly to unexpected events, deteriorates as you stay awake beyond your regular bedtime. We don’t know exactly why this is but it may be that parts of your brain go to sleep even when you’re technically awake. But with the right motivation, we can also force ourselves to stay awake and even restore our performance temporarily. How long we need to sleep or can stay awake for depends to some extent on our genes, but evidence suggests they are also affected by what activities we do while we’re awake. Surprisingly, we still don’t know what is it about being awake that puts pressure on our bodies to sleep, but scientists often refer to is as “Process S”. Like an hourglass, the levels of Process S indicate how long we’ve been awake or asleep and how likely we are to fall asleep or wake up at any given moment. Recent evidence suggests that sleep is initiated not by the brain as a whole but by local networks of neurons that were used more while awake. My colleagues and I wondered if parts of the brain responsible for certain behaviours had more of an affect on our ability to stay awake than others. To test this theory, we made use of a well-known tendency for mice to run spontaneously on a wheel, sometimes covering many kilometres every night. When mice run like this, they spend considerably more time awake, as if their need to sleep were accumulating at a slower rate, or if something were overriding it. To shed light on this mysterious process, we investigated exactly what happens in the brain of spontaneously running mice. 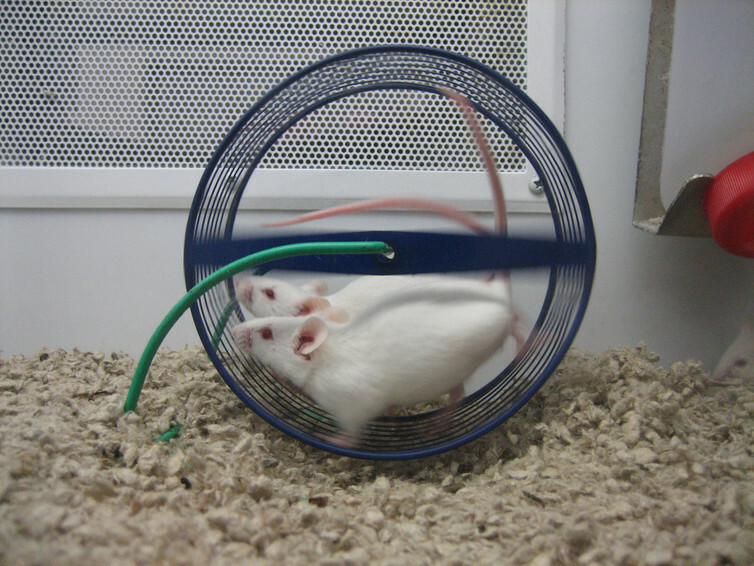 In our study, we recorded the electrical activity of individual nerve cells in each mouse’s neocortex – the outer layer of the brain – as they ran on a wheel. Typically, when a mouse (or a human) is awake and active, neurons fire at a high rate. This is because the brain has to monitor the surroundings, coordinate movements, and take decisions instantaneously. This constant brain activity requires a lot of energy – an estimated 20% of all energy used by the body. Surprisingly, we found that when the mice ran at high speed, some of their neurons stopped firing altogether. And the overall brain activity in the motor and sensory areas of the neocortex decreased on average by at least 30%. Paradoxically, this suggests that, overall, active physical behaviour and intense movement do not necessarily require a more active brain. We also noticed that when the animals engaged in lots of different behaviour, their neurons would spike in a variety of different ways, from slow to fast discharge. But during the monotonous process of running, the neural spikes became much more consistent. This suggests that running is associated not only with less activity overall but also with an emergence of a more stable, uniform brain state. Our next question was whether this would make a difference to overall brain activity during the course of extended waking periods. Previous studies suggested that the longer you stay awake, the more excitable your brain becomes (the more likely your neurons are to fire). We found that our mice’s neurons on average produced more spikes before they went to sleep than in the period soon after waking up, a few hours earlier. But if the mice spent a lot of time running, this increase in spiking didn’t happen. This suggests that if the neurons are not used then they don’t become more excitable. Based on these observations, we concluded that if a mouse’s day was dominated by tasks requiring repetitive or rhythmic movements (such as running), its brain would be in a fundamentally different state to normal. This state may even allow the brain to rest without entering deep sleep and provide some of the same benefits. Recent evidence consistently suggests that short periods of exercise may be beneficial for cognitive functions in a similar way to sleep. Other examples from nature support this idea. For example, birds sleep far less when they’re flying non-stop for many days or migrating. There is even some evidence of a similar effect in humans, such as a link between meditation and a reduced need for sleep. We don’t know for sure why this happens but it may be that meditation is associated with a brain state where time effectively runs slower. And it could be the same for the mice on the wheel. There are still many questions to be answered about why we need to sleep and how it effects our brains. But what is becoming increasingly clear is that we cannot understand the mystery of sleep without understanding what happens when we’re awake.